Every year we see more plantation window shutters in Manchester as people wake up to the many benefits of this popular alternative to curtains and blinds. Plantation shutters (also referred to as interior shutters) originate from the plantations of the hot American Deep South and were prized for their thermal insulation properties. These properties are just as valuable for window shutters in Manchester and other northern UK cities and towns because they keep heat in as well as out. Other benefits of plantation window shutters are their ability to regulate light, air and privacy. Louvres can be finely adjusted to admit the precise amount of light required while keeping prying eyes out, or the shutters can be opened completely (each type of shutter operates slightly differently depending on their style). 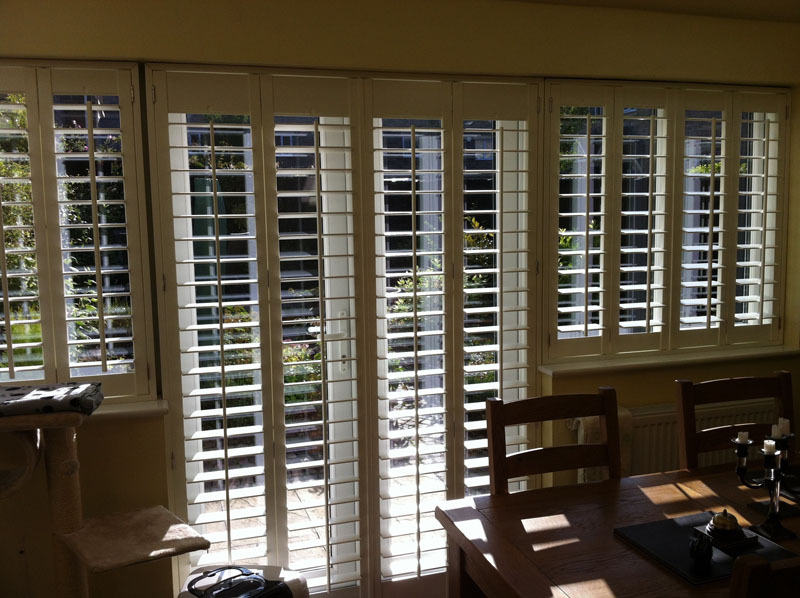 Plantation shutters are also a good way to dampen down noise – both external and internal. Plantation shutters are also supremely stylish, which is why they are an increasingly common sight in the houses and businesses of a fashion-conscious city like Manchester. Of course, it is also possible to make a mistake by purchasing sub-standard plantation shutters, choosing the wrong shutters for your window space or fitting them incorrectly. This is where we can help. We are one of a small number of companies with extensive experience in delivering and fitting window shutters in Manchester. We have been in the industry since the 1980s and can offer all the benefits of over 40 years combined experience in our profession. We always provide a free home survey and design consultation whereby we can show you our range of products, understand your unique style preferences and impart our own advice where needed. Our team is built from experienced surveyors and fitters so you can enjoy the peace of mind of knowing that your design brief is in capable hands. We supply and fit a fantastic range of quality wooden and non wooden shutters in Manchester and beyond. For example, you can choose from the pleasantly scented and natural moisture-resistant qualities of cedar wood; the versatile and even finish of basswood; the economical appeal of larch wood (our Fiji range) or the extremely robust and waterproof PVC or false wood alternatives. Our commitment to quality products is matched by our attention to detail during the manufacturing process. All of the wood we use is initially stored for at least six months before being carefully dried in accordance with the local climatic conditions. The joinery involves the use of strong mortice and tenon joints rather than crack-prone dowel joints, and even shutter louvres are designed to allow expansion without damaging the fine finish of our paint/stain coats. All products have at least three years’ warranty with some extended up to ten years. Despite the high standards above, our prices remain competitive and we are confident that we can cater for all budgets. For more on installing window shutters in Manchester or the surrounding area, please contact us today.